Looking for a great deal on LG's two high-end Android smartphones? 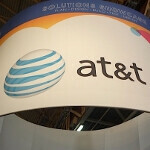 You don't have to look any further than you local AT&T store. The nation's second largest mobile carrier is offering the LG Optimus G for just $49.99. 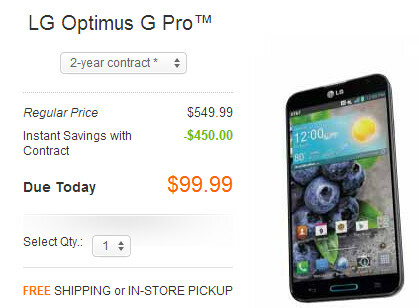 If you're looking for something a little more phablety (to coin a new word), the LG Optimus G Pro is priced at $99.99. Both deals require you to put your John Hancock on the dotted line. We should mention that these prices disappear on July 25th. The LG Optimus G offers a 4.7 inch LCD screen with resolution of 768 x 1280. A quad-core 1.5GHz Qualcomm Snapdragon S4 Pro processor powers the device, which has 16GB of native storage with a 64GB capacity microSD slot, and an 8MP rear facing snapper. The LG Optimus G Pro features a 5.5 inch display with 1080 x 1920 resolution (FHD), and a quad-core 1.7GHz Qualcomm Snapdragon 600 processor is under the hood. While 32GB of native storage comes with the phone, the device does offer a 32GB capacity microSD slot. A 13MP shooter graces the back of this model. Both phones include features like QSlide which lets you multitask by allowing two apps to run at one time with one appearing translucent. Using the sliding bar on the screen, you can adjust which app becomes see through, and which one appears solid. Some prefer this to cutting a screen in half to allow two apps to run at the same time. Optimus G Pro has a Qi wireless charging backplate as part of the package. Why does nobody mention this? It was a big deal for the Nexus. I had the optimus g pro but swapped for the active s4 but the optimus is a nice device. Just curious, why did you swap out the G Pro? I work outside and wanted a smaller and more durable phone. The optimus was an absolute beast though! Screen is flawless and fluid and smooth. The camera was kinda weak but I dont buy a phone for that. Honestly at $99, it is the absolute best deal on the market right now!